The guns of August began pounding 100 years ago this week as one by one the countries of Europe went to war. The United States would not enter the conflict for almost another three years. Two of the biggest advocates for Preparedness before and during the war were Theodore and Franklin Delano Roosevelt. Both had spent parts of their careers as Assistant Secretaries of the Navy, and Franklin was serving in that capacity when the war began. He was in a difficult spot; as a low ranking member of the Woodrow Wilson Administration he did not have the freedom to speak the way his cousin, and wife’s uncle, did. Still FDR worked indefatigably, in that way the Roosevelts had, to help modernize the U.S. Navy, much as Uncle Ted had organized the Great White Fleet and sent it around the world a few years earlier. Naval power only became more important after the opening of the Panama Canal on August 15, 1914. Throughout the war Franklin also kept Theodore informed of the palace intrigues within the State, War, and Navy Building. Here is an incredible image from the National Archives of FDR at the laying of the keel of “Number 39,” the ship that would become the USS Arizona. (Learn more about the image’s provenance.) 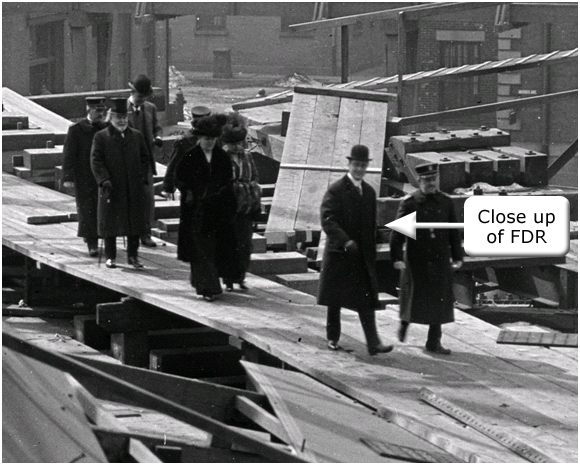 This was in the Brooklyn Navy Yard, March 16, 1914, exactly one full year into his assistant secretaryship. The Arizona began its sea trials in 1916. I don’t know if ironic is the word for it but, in a twist, the Arizona would be sunk at Pearl Harbor in 1941.